I love to share what I love. I love to share what makes me happy. I love to share precious moments from our life. I love to share my thoughts. I love to share the books I read. I just love to share moments. Today I would love to share few thoughts about the book I have finished to read a few days ago. This is one of the most touching books I have ever read and I would love that everyone of you could find this book and read it, believe me, you will love it. This book will open your heart and it will make you a better person. "Dying," Morrie suddenly said," is only one thing to be sad over, Mitch. Living unhappily is something else. So many of the people who come to visit me are unhappy." "Well, for one thing, the culture we have does not make people feel good about themselves. We're teaching the wrong things. And you have to be strong enough to say if the culture doesn't work, don't buy it. Create your own. Most people can't do it. They're more unhappy than me - even in my current condition. "I may be dying, but I am surrounded by loving, caring souls. How many people can say that?" 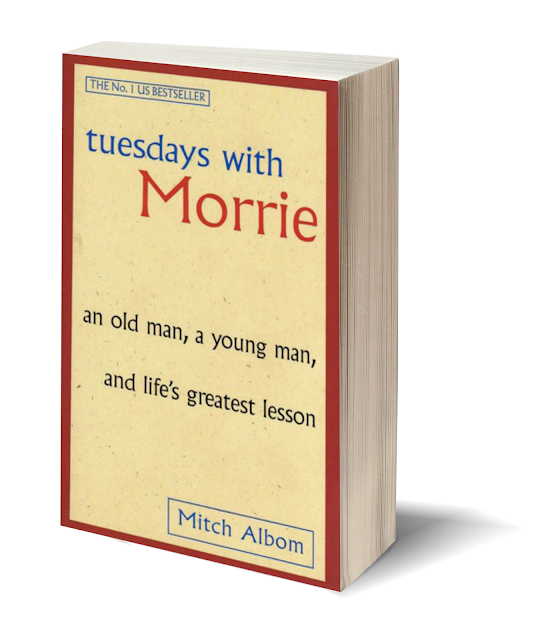 I thought of something else Morrie had told me: "So many people walk around with a meaningless life. They seem half-sleep, even when they're busy doing things they think are important. This is because they're chasing the wrong things. The way you get meaning into your life is to devote yourself to loving others, devote yourself to your community around you, and devote yourself to creating something that gives you purpose and meaning." "There is no experience like having children.’ That’s all. There is no substitute for it. You cannot do it with a friend. You cannot do it with a lover. If you want the experience of having complete responsibility for another human being, and to learn how to love and bond in the deepest way, then you should have children." "I give myself a good cry if I need it. But then I concentrate on all the good things still in my life. On the people who are coming to see me. On the stories I'm going to hear… Mitch, I don't allow myself any more self-pity than that. A little each morning, a few tears, and that's all." "When I have people and friends here, I'm very up. The loving relationships maintain me." "Everyone knows they're are going to die, "he said again, "but nobody believes it. If we did, we would do things differently." "Forgive yourself. Forgive others. Don't wait, Mitch. Not everyone gets the time I'm getting. Not everyone is as lucky." Be good with you, be good with everyone and do good things to others! Dear Liuba, this sounds like my kind of book! Thank you so much for sharing, dear friend. Now that's are the real lessons! Thank you for sharing all your positivity with us! book really sounds amazing ,written in a simple but beautiful way .touching thoughts displayed in lines go straight in heart and warm the soul . thank you for sharing as i love to read your sharing so honest so pure . I do enjoy my motherhood, I am so proud to be Nikita's mama :) I feel so blessed! "Dragostea câștigă. Dragostea învinge întotdeauna." Am omis să-ți spun că” minuneaea de Îngeraș”îți seamănă perfect! O săptămână frumoasă și plină de zâmbete vă doresc dragilor! Vă pupic,îmbrățișez cu multă căldură și ție scumpo îți mulțumesc de vizită! Loved reading the beautiful and thought-provoking quotes you shared. Great one about people doing things differently if they really believed they were going to die. Also a great reminder to invest and people and relationships. And I think he's right about a lot of people walking through life without meaning--half asleep. There's a Bible verse that says, "And you hath he quickened (made alive) who were dead in trespasses and sins..." It's wonderful to find meaning and purpose and the things that make life worth living in Christ and loving others. what a beautiful message this book conveys! i hope to read it one day...now with college i barely have time to read the endless pages required for my courses, but i hope to do some "personal" reading on the side as well. much love to you, darlin! One of my friends recommended this one to me too and I would love to read this one. Glad you enjoy reading his books.